This is the Chinese version 16 inch expanding police baton. Steel batons with a firm rubber grip. Comes with free nylon sheath. 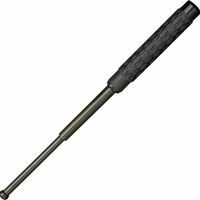 These solid steel expandable batons will telescope maximum length with just a flick of the wrist. Designed with a high retention rubber covered handle for easy gripping and a FREE heavy-duty nylon holster for easy carrying on a belt. Tap straight down on solid ground to close. Closed Length is 6 and 3/4ths inches . A great self defense device that provides power and distance in any confrontation. Great to keep dogs at bay as well.